The Trick to Managing The Treats - Am I Hungry?Am I Hungry? Halloween candy showed up in August (as though we needed to get a jump on our holiday shopping!) and will still be on sale in November. What is the trick to eating what you love when it is everywhere? Halloween can be a scary time of year for those trapped in an eat-repent-repeat cycle. You seem to be haunted by all that candy in the house, leading to a full-blown candy binge, chocolate hangover, and vows to do better tomorrow. The tricky part is that labeling the foods you love as evil actually increases their power over you. When what you really crave is “bad,” you feel guilty for even wanting it and deprived because you can’t have it. The result? You find yourself foraging treats from the pumpkin basket and burying the candy wrappers at the bottom of the garbage can so your kids won’t find out. And what does this say to your kids when they inevitably find out that you’ve been sneaking and stealing their candy? Talk about guilt! Get your own. You’ll be less tempted to get into the kid’s holiday candy if stop depriving yourself the rest of the year. Scary, I know. Learn how in Eat What You Love, Love What You Eat, Chapter 5: Fearless Eating. Share! 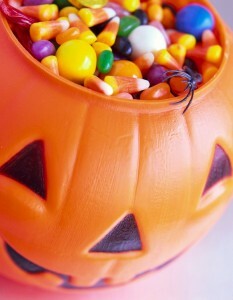 If you really want some candy, ask your child to share a few pieces with you. Through observation, they learn that it is possible to balance eating for nourishment with eating for enjoyment. Eat what you love. Skip the sugary kid candy (unless that’s what you love) and instead choose a few that you really love. Set them aside to eat when you really want them (I like to keep mine in a plastic bag in the freezer). Save room for dessert. If you’re going to eat Halloween candy (you know you are! ), then adjust for it. After all, does it really make sense to eat all your dinner to earn dessert? If you love it that much, act like it! Enjoy those M&Ms one at a time, mindfully without distractions. Just right! The fun-sized treats are the perfect size for a few mindful bites of heaven. And those first few bites are always the best, so think before you dive in for more. Eat fearlessly without guilt. We all know that guilt leads to more eating, not less, so let it go. Don’t torture yourself with exercise. Being physically active feels good and provides numerous benefits for your health; don’t turn it into punishment for eating.